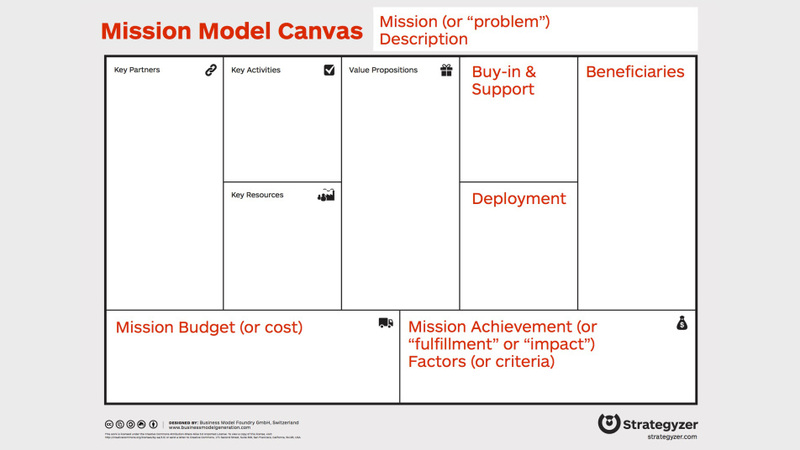 As we prepared for the new Hacking for Defense class at Stanford, we had to stop and ask ourselves: How do we use the Business Model Canvas if the primary goal is not to earn money, but to fulfill a mission? In other words, how can we adapt the Business Model Canvas when the metrics of success for an organization is not revenue? Alexander Osterwalder and I think we have the answer - the new Mission Model Canvas. Here are our collective thoughts. The Lean Startup is the way most innovators build startups and innovate inside of existing companies. 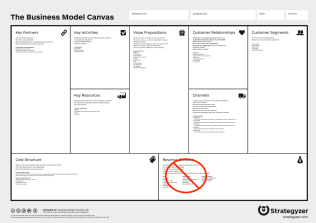 As a formal method, the Lean Startup consists of three parts: The Business Model Canvas - to frame hypotheses, Customer Development - to test those hypotheses in front of customers, and Agile Engineering - to build Minimum Viable Products to maximize learning. For these organizations, the canvas box labeled Revenue Streams doesn't make sense. In a mission-driven organization such as the defense and intelligence community, there is no revenue to measure. So the first step in building a canvas for mission-driven organizations is to change the Revenue Stream box in the canvas and come up with a counterpart that would provide a measure of success. We're calling this alternative Mission Achievement. Later in this post I'll explain how we'll measure and describe Mission Achievement, but first our Mission Model Canvas needs four more tweaks. At first glance, when developing a new technology for use in the defense and intelligence community, the customer appears obvious -- it's the ultimate war fighter. They will articulate pains in terms of size, weight, form fit, complexity and durability. But there are other key players involved. Requirement writers and acquisition folks look at systems integration across the battlefield system, while contracting officers, yet another segment, will count beans, measure the degree of competition and assess the quality of market research involved. The support organizations need to worry about maintainability of code or hardware. Does legal need to sign off for cyber operations? So yes, war fighters are one customer segment, but others need to be involved before the war fighter can ever see the product. Second, in the defense and intelligence communities almost all of the mission models look like that of an OEM supplier -- meaning there are multiple layers of customers in the value chain. Your product/service is just part of someone else's larger system. So to differentiate "customers" from the standard business model canvas we'll call all the different customer segments and the layers in the defense and intelligence value chain beneficiaries. Of all the nine boxes of the canvas, two important parts of the model are the relationship between the Value Proposition (what you're building) and the beneficiaries. 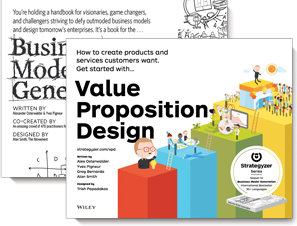 These two components of the business model are so important we give them their own name, Product/Market Fit. 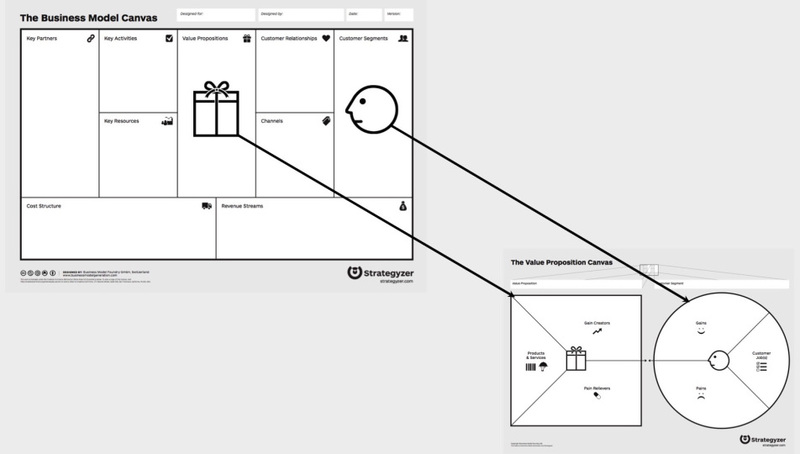 Because of the complexity of multiple beneficiaries and to get more detail about their gains and pains, Osterwalder added an additional canvas called the Value Proposition Canvas. This functions like a plug-in to the Mission Model Canvas, zooming in to the value proposition to describe the interactions among these beneficiaries, war fighters, etc. and the product/service in more detail. Using the Value Proposition Canvas with the Mission Model Canvas lets you see both the big picture at the mission model level and the detailed picture of each beneficiary at the "product/market fit" level. In the defense and intelligence community mission models, there will always be multiple beneficiaries. 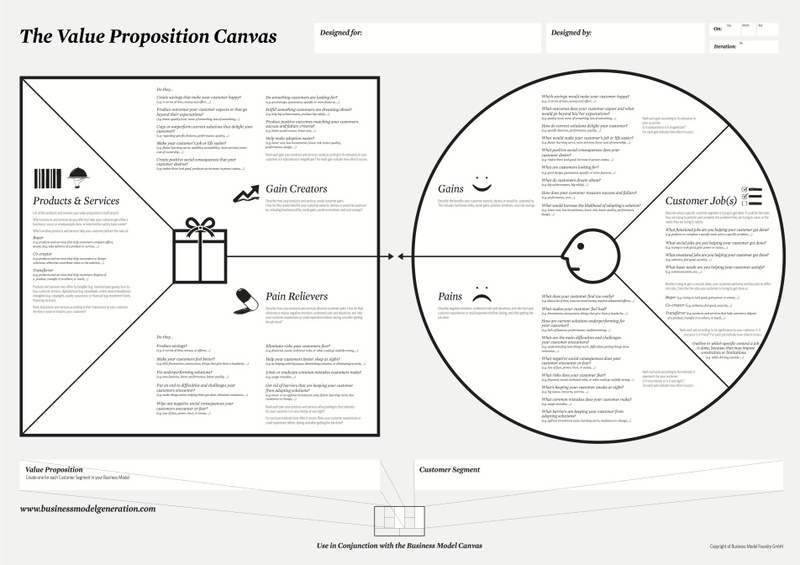 It's important that each beneficiary gets its own separate Value Proposition Canvas. "What constitutes a successful deployment? (number of users, units in the field, time to get it into the field, success in the field, etc.)" "How do we turn a Horizon 3 innovation into something that gets adopted by a Horizon 1 organization?" For the defense and intelligence communities, we have modified Customer Relationships to mean, "For each beneficiary (customer segment), how does the team get "Buy-In" from all the beneficiaries?" At the Pentagon a favorite way to kill something is to coordinate it to death by requiring buy-in from too many people too early. How to determine who are the small group of critical people to get buy-in from - and how to determine who are the next set required to sustain the iterative development of future MVP's - is one of the arts of entrepreneurship in the defense and intelligence community. Mission Achievement is the value you are creating for the sum of all of the beneficiaries / the greater good. 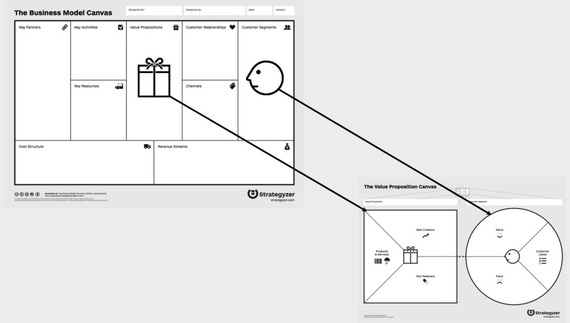 It's important to distinguish between the value for individual beneficiaries (on the Value Proposition Canvas) and overall Mission Achievement. For example, Mission Achievement could be measured in a variety of ways: the number of refugees housed and fed, the number of soldiers saved from roadside bombs, the number of cyberattacks prevented, the increased target surveillance of sensor fusion, etc. None of these are measured in dollars and cents. Keep in mind, there is only mission achievement if it delivers value to the end beneficiary.